iPhone Sudoku Grab: How does it all work? Thanks to everyone for visiting - you can get Sudoku Grab from the app store for 99cents. I get the odd email from people asking how Sudoku Grab works. I've replied to quite a few individually, but I thought it would be much easier to just explain it on the blog. Also when I demo the app people are often amazed (and equally, some people are also often not amazed...). For the ones that are amazed they can get a bit enthusiastic and start coming up with all sorts of amazing ideas on what you could do with "the technology". I then have to explain to them that it's actually not doing anything really clever and that their idea might actually be quite a hard problem in comparison. A good source to get started with is the OpenCV library which can be compiled on most platforms (including the iPhone). I wish I'd been aware of it before I started this project as it would have saved quite a bit of time. One of the things that makes recognizing Sudoku puzzles an easier task than most image processing/recognition problem is that it is a highly constrained problem - a standard Sudoku puzzle is going to be a square grid and it will only contain the printed numbers 1-9. These two points are very important. The first point - it's a square grid tells us what shape a puzzle is and what we should be looking for in an image. The second point - it will only contain the printed numbers 1-9 tells us that we aren't going to need a sophisticated OCR system. When we look at the problem there's nothing that jumps out and says "nobody has solved this before - it's probably really hard". A user is going to be photographing the puzzle - they aren't going to take a picture of a whole newspaper page, they won't be taking a photograph of a coffee shop and expecting us to find a sudoku puzzle that someone is playing four tables away. Also, the user is going to try and capture the whole puzzle, they won't miss a corner or chop off the top. The puzzle will be orientated reasonably correctly. No-one (hopefully) is going to be taking a picture of an upside down puzzle, and typically they will be trying to align it nicely in the camera viewfinder so it is reasonably straight without too much distortion. We can see that this meets all the assumption above. We've got the whole puzzle - there are no bits missing, the puzzle is reasonably straight - it's not upside down or at some crazy angle, it's also the main thing in the picture - there's not a lot of distraction in the image, it's just a picture of a sudoku puzzle. Once i've found the puzzle how do I turn it back into a square puzzle? I've got the puzzle - how do I find the numbers? How do I recognise the numbers? 1. Where is the puzzle? The first thing to do in any image processing problem is to reduce the amount of data you are dealing with. We started from the full colour high resolution image. The first thing we can do is to throw away the colour information. Looking at our sample image, having colour does not add any information that is useful to us*. What else can we see - an obvious thing is that this is a printed page, it's basically a black and white image. So the first step in our image processing is to throw away even more information. We are going to threshold the image so that we have either background pixels (the paper) or foreground pixels (the printed elements). It's kind of ok - there's some paper showing up as foreground in the top left, but the puzzle is also showing up, but as we go down towards the bottom right the puzzle starts to break up. We can see that this simple approach doesn't really handle variable lighting on the page. And we can imagine that if there are any shadows on the page the results will be even worse. What we need is a thresholding method that can take account of this problem. My personal favourite is a simple adaptive threshold. For each pixel in the image take the average value of the surrounding area. If the pixel is less than 90% of this value then it is ink, if it is higher then it is paper. The reason for choosing 90% of the value is that this lets us filter out flat areas or areas that aren't changing very much (ie blank bits of paper or solid black sections). As you can see it's a lot better than the previous attempt. 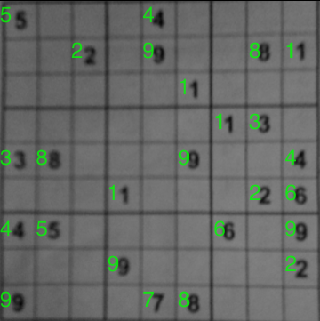 We can now apply one of our assumptions: "In a photograph of a sudoku puzzle, the puzzle is going to be the main/most important object on the page" - we can interpret this in the following way - the most important thing on the page probably has the most foreground pixels. So let's extract every blob of set pixels and see which blob has the most. That blob of pixels must be our Sudoku Puzzle. To do this we'll using a blob extraction algorithm. The simplest way of doing this is to scan through the image looking for a set pixel. Every time we find a set pixel we perform a "flood fill". The pixels that we fill in make up our blob. So, that's great, we've managed to go from an picture of a puzzle in a newspaper to finding the pixels which are probably part of a Sudoku puzzle. Most importantly we have the pixels that make up the outside frame of the puzzle. Now what? Ideally it would nice if we knew the coordinates of the corners of the puzzle frame - that would let use draw a box around it and know the exact location of it. There are quite a few ways that we could approach this. A simple approach might be to scan through the pixels looking for the top left, top right, bottom left, bottom right. That might work. I've chosen to use one of my favourite algorithms; the Hough transform. You can have a play with hough transforms here. This image represents all the possible lines that are in our image. 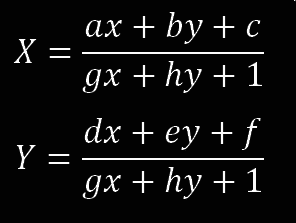 The x coordinate is the angle of the line and the y coordinate is the distance of the line from the origin (I've trimmed the image to make it a bit smaller so our y coordinate looks a bit smaller than it would normally). We can see that we have a bunch of peaks around 0 and 180 degress mark (on the left and the right of the image) and a bunch of peaks in the midle of the image, around the 90 degrees mark. These correspond to horizontal and vertical lines in the image. We really only care about the leftmost, rightmost, topmost and bottommost lines. These correspond to the peaks at the top and bottom of the two groups. We now know exactly where in the original image we have found the Sudoku puzzle! 2. Once i've found the puzzle how do I turn it back into a square puzzle? So, we've got the corner points of the puzzle - it's currently not really usable for much - it's a bit distorted. What we need is some way of mapping from the puzzle in the picture back into a square puzzle. 3. I've got the puzzle - how do I find the numbers? 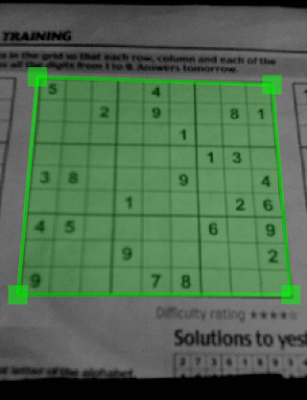 So we're pretty good - we've now got an undistorted square Sudoku puzzle. That's good, but it doesn't really help us that much - we could have got this far by making the user line up the puzzle with a square shape in the viewfinder when they took the picture! Let's try and see which boxes in the puzzle actually have numbers in - this is actually pretty straightforward, all we have to is divide the puzzle into a set of boxes threshold each box and apply the blob extraction algorithm to the middle of the box. If we manage to extract a blob then it's more than likely that the box must contain a number. Throw away the empty boxes and you've got the numbers that you need to recognise. 4. How do I recognise the numbers? We can now take the blobs from the previous stage and try and work out what numbers they represent - this is where the world becomes your oyster. There are a huge number of techniques for performing OCR. And a huge number of non-specific pattern recognition algorithms. 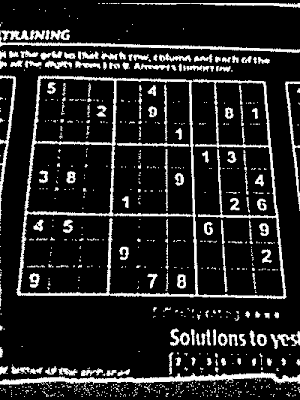 Anyway - this gives us our final result - a Sudoku puzzle with recognised numbers! There are a huge number of improvements that can be made to these basic steps. You can add intelligence at every step to improve your chances of recognising a puzzle. Expect a lot of copycats! O wait, it's not exactly a Fart app. "You can intelligence at every step to improve your chances of recognising a puzzle." 70% of 25K in half a year is nor bad for one app. A lot of developers would love to have those numbers. I don't play Sudoku, so I didn't buy it, but I'm tempted to do so just to experience how your "magic" works in practice. Thank you for sharing this! I've always wondered how image processing works. This is a great post, thanks a lot. I had a similar idea some months ago, but didn't start as I hadn't a clue how to do the "OCR" stuff. Also, I told a friend about this idea and he just laughed at me. Well... and said that probably somebody else could have had the same "stupid" idea. And here you are :-). @mare - no worries. I'll see if I can tempt you with the next app (if it ever goes live!). Thanks so much for sharing this, it was very encouraging to see how all the pieces work together and with a very high level overview of the algorithms. If you're using any particular implementations of any of the algorithms that are public (besides what's in OpenCV), it'd be great if you could post those. When I started the project I didn't know that OpenCV was available for the iPhone so I ended up rolling my own implementations. That has almost everything you need apart from the hough transform and the perspective correction code. The demo doesn't run on my mac. Did anyone else manage to get this working? http://homepages.inf.ed.ac.uk/rbf/HIPR2/houghdemo.htm - this needs a later version of java than the one that ships as standard with the mac. There's a very nice interactive demo here: http://users.cs.cf.ac.uk/Paul.Rosin/CM0311/dual2/hough.html that runs nicely on macs. When App store is available for Kenya, I will surely buy it. Good explanation. Do you have any tips, links, etc. on how you coded the neural network? I have always been fascinated by neural nets, but I have no idea how to get started. Thanks for sharing this article, BTW! Take a look at the Backprop c++ code - that has sample code for training and using a neural network. Also bought it to prove what a smart ourchase my iphone is. Could this theoretically work for reading the numbers under barcodes and prices on supermarket shelf tags? 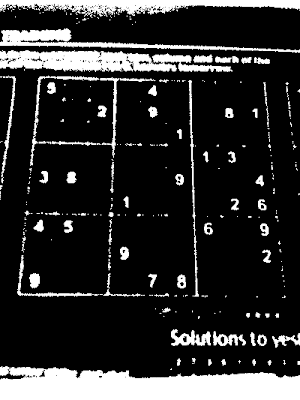 Nifty app, great blog post, but I haven't had much luck with the USA Today puzzles which are printed with a gray background on some of the squares. I wouldn't be surprised if that's throwing off the detection. When working with the local thresholds, how big is the surrounding area you consider? just all adjacent pixels? or a larger swatch? @Steve, yesm that would cause some problems but it should be possible to work around it - if anyone has a good example picture then send it to the support email and I'll take a look. @Phil - I currently look at an area 8x8 pixels. Saw you present this at the LiDE, what a brilliant app! Thanks for sharing such great information about the techniques used. I'm playing around with some Java looking at blog extraction, could you point me towards any more information about the flood fill technique you used? I thoroughly enjoyed reading this. Fantastic. any plans to bring sudoku grab to the android market or are you locked in with apple? I think it would do very well on android. I have a Droid Eris and would love this app! I had the exact same idea in April 2009. But due to my lack of iPhone dev skills I didn't manage to do it! Congrats on doing a very good job! Hab viel aus deinem Beitrag gelernet. I'm the author of Sudoku Grab'n'Play, a similar app for Android. This post was very inspiring for my own work and I'd like to thank Chris for sharing this with us. I decided to write some posts too and give insight into my own app including code samples in Java. If you want to dig even deeper than you already did by reading this post, feel free to visit www.1gravity.com (go to Coder's Blog). At the moment there are still only three posts about thresholding but there will be more about blob detection, neural networks and pattern matching coming in the near future. If there was an iPhone app to capture chess diagrams, I'd buy it in a flash. It would be great to analyze and play positions shown in chess books without having to enter all the pieces manually. Thanks. Nicely explained. Just bought one to say thanks. Great post, many thanks for sharing! Awesome. Thank you for the post!